Do you have more than one or two decoder equipped locomotives? Do you like to customize your decoders to your preferences? Do you want to test your decoders before installing them? 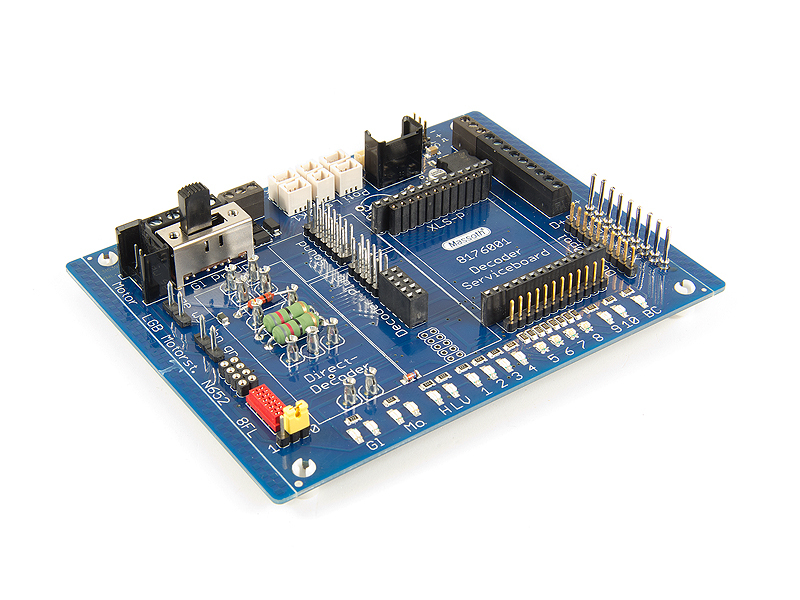 If you answer is yes, then the Massoth Decoder Service board is for you. The board allows programming and testing of nearly all currently available G-scale decoders. It has interface sockets for many interface-equipped G-scale decoders, as well as screw-down and plug-in terminals for connecting decoders without interface. The board offers a wide variety of connections for accessories such as loudspeakers, uncouplers, servos and SUSI modules. It has connections for a hall-effect sensor, a reed switch, a power buffer and a potentiometer for sound volume control. It also has a direct connection for an LGB motor block and screw-down terminals and plug-in pins for connecting a motor and track power. The Massoth Decoder Service Board, with all of its available features, makes programming and testing of all kinds of G-scale decoders a relatively easy task. PluG decoder interface for eMOTION XL II PluG, etc. PluG sound interface for eMOTION S PluG, etc. M1 interface (Märklin Gauge 1) for eMOTION XLS-M1, etc. Nine-pin Plug-in interface for XLS, XL, XXL, etc. Ten-pin DCC interface for LGB 55027, etc. Direct decoder interface for eMOTION L, L55021, etc. Function decoder interface for eMOTION 8FL, etc. Four-pin LGB motor block socket for LGB on-board-decoders, etc. Copyright © 2011 - 2019 AllAboutLGB. AllAboutLGB is an authorized dealer for Massoth and Märklin-LGB.